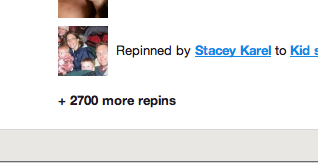 It's been repinned at least 2700 times!!!!! That blows my mind. It's like you've believed all your life that you had a few screws loose because of your bizarre cardboard fetish, and then finding that, actually, there's a whole tribe of people like you out there and maybe cardboard isn't a disease after all. Thank you everyone for spreading all that cardboard love! You made my day. P.S. I'm working on those alterations tuts! But I decided to bite the bullet and do Emily's party photos. So you get to see those first! I don´t know why you are surprised! 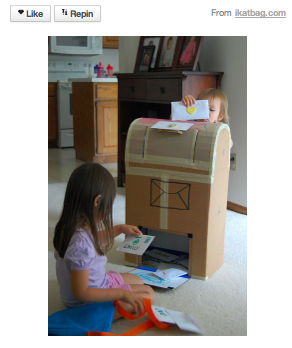 your mailbox is simply perfect. congrats and thanks for sharing! Wow, well done! 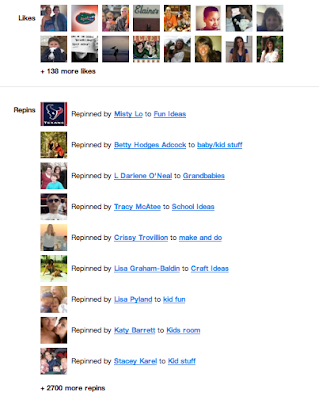 I've seen precisely 2 of my projects pinned, just the once each! Where can I find you on Pinterest? Oh yes, LiEr. There is a tribe. And you are our fearless leader, the one who actually writes whole posts identifying the varying kinds of free cardboard and their comparative uses. we do love you LiER. I have just joined Pinterest after your post. Almost as addictive as ikatbag.com and cardboard. I have pinned some of your ideas that i adore..and repinned many that others had already put up. Thank you for your unstoppable creativity and your cool humour. LiER ROCKS!